The Çanakkale 1915 Bridge, also known as the Çanakkale Strait Crossing is currently under construction in the Çanakkale Province in northwestern Turkey. Its name evokes the fierce battles fought at Gallipoli in 1915 in the early stages of World War I. Situated just south of the towns of Lapseki and Gelibolu, the bridge will span the Dardanelles Strait, about 10 km south of the point where the Sea of Marmara narrows into the strait. The bridge is the centerpiece of the 321 km long USD 2.8 billion Kınalı-Balıkesir Motorway. With a main span of 2,023 m the bridge will surpass the Akashi Kaikyō Bridge in Japan by 32 m to become the longest suspension bridge in the world. The bridge will become the fourth tallest bridge in the world, surpassing the Sutong Bridge in China. The deck of the bridge will be at 72.8 m high above sea level and have a total width of 45.06 m (147.8 ft) and a maximum deck depth of 3.5 m. The deck will carry six lanes (three in each direction) of motorway, together with two walkways on each side. The General Directorate of Turkish Highways has awarded the 1915 Çanakkale Bridge and Motorway Project within the framework of a Public Private Partnership model to a Turkish-Korean consortium, which in turn created a joint-venture Commissioned Company specific to the project. Çanakkale Motorway Bridge Construction Investment Management Inc. is the Commissioned Company for the 1915 Çanakkale Bridge and Motorway Project. The partners of the Commissioned Company are Limak (limak.com.tr) and Yapı Merkezi (ym.com.tr) of Turkey, and Daelim (daelim.co.kr) and SK E&C (skec.com) of Korea. Daily tour participants will journey back to Istanbul hotel where their tour ends around 23:00. The 2 Day program participants will check in to their hotel in Gelibolu where they will have their dinner as well. Participants will be able to visit the historic sites of Troy. 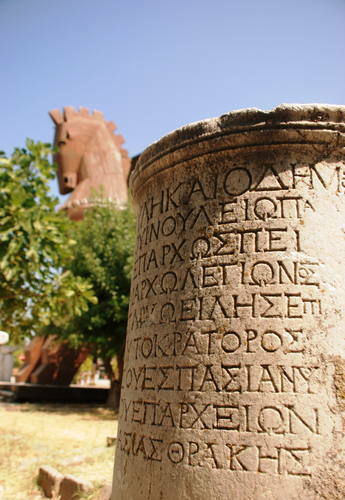 The Archaeological Site of Troy has 4,000 years of history. Its extensive remains are the most significant and substantial evidence of the first contact between the civilizations of Anatolia and the burgeoning Mediterranean world. Excavations started more than a century ago have established significance in the understanding of the development of European civilization at a critical stage in its early development. Moreover, the siege of Troy by Mycenaean warriors from Greece in the 13th century B.C., immortalized by Homer in The Iliad, has inspired great artists throughout the world ever since. The site is listed as World Heritage property by UNESCO and 2018 is declared as The Year of Troy. After finishing our cultural program, participants will return back to Istanbul city center & airport where the tour ends at 8 pm (Dinner will be at Tekirdağ during the trip to İstanbul). Lunches, Professional tour director at your service throughout the tour, Land transportation by private air-conditioned minibus or motor coach depending on group, Sightseeing as described in the itinerary, Museums and the sites entrance fees, Accommodation in a 4 star hotel in Gelibolu for 2 Days Participants. Personnel expenses, Customary tips to your guide and to your driver. Only the registered participants and registered accompanying persons are allowed to participate iBridge 2018 Technical Tour program. The participation to Technical Tour is limited to 30 participants. Reservations will be confirmed first come first served basis. Refunds, less a 50.-USD service fee and bank charges, will be given if written cancellation is received by September 25, 2018. No refunds will be given after September 25, 2018.